Stockport Metro branded Speedo Fastskin3 racing caps with the swimmer’s name printed on the cap are available for special order. These are racing swim caps made from 100% silicon and are FINA approved. They are quite tight and not suitable for swim training, they are for racing. 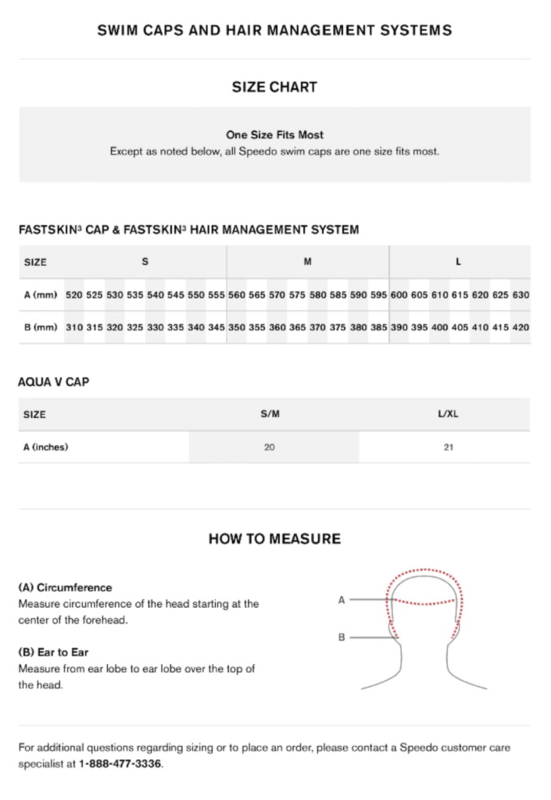 The sizes available are medium and large (see size chart below, the hats do run small and can be tight, if you are in any doubt chose a larger size). There is a minimum order quantity of 25. If we receive the minimum order quantity by the 1st March 2019, then the order can be processed so the caps will be received for the Stockport Metro Qualifying Open on 29th March 2019. The swimmers will therefore have their caps for the Swim England North West Summer Championships (Regionals). Prices are £32 including name per cap, if you order 2 with the same name, the costs is £62.80 (£31.40 per cap). Payment by BACS to the SM bank account, details to be confirmed by email once the order is received.